"Eager to win and to become the number one? Show it on KartWars.io, the sensational new multiplayer online game where only the strongest will be able to own the battlefield. Face other karts with unbelievable power, customize your kart, overcome adversities and lead the world rankings. KartWars.io is an innovative game where your reflexes are just as important as your skills. Customize your Kart, choose your nickname and take on dozens of players in the same battlefield. Use cannons, guided missiles, bombs or storms to dominate your enemies. Surpass your rivals and represent your country in the world ranking. But remember... there is only one champion. Could it be you?" 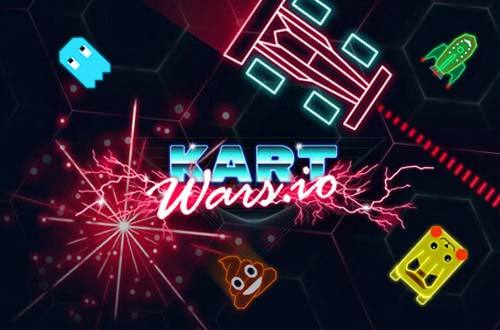 Kartwars.io is a funny MMO free-to-play game where you will have to show your driving skills. But it’s not only about speed. You will have to attack the other cars, eliminate them from the game and steal their items. If you are willing to attain the lead and become the winner of Kartwars.io you will have to be very fast. Are you ready? Prepare your engines and get it started! This massive multiplayer game will test your reaction and speed. Just like in other popular io.games you will be collecting coins and items on the way and you will have to avoid the enemies. On Kartwars.io the coins you will find and collect will be essential for your survival as they will give you shields and extra speed. Everytime you activate this shield or you accelerate you will lose some of these coins that you will have to regain if you wish to protect yourself against the enemies attacks. So, get tons of coins and learn how to ration the use of your shield! Moreover, on the lawless track of Kartwars.io where dozens of cars race at the same time fighting for survival, you will find any kind of bomb and weapon. Collect these items and attack your enemies but keep an eye on the traps or you will end up in the air. You have also to look out for the enemies attacks, as you play at the same time from any part of the world. Bombs, missiles are following you, shields are making you explode... On Kartwars.io only the strongest and smartest driver will triumph. On Kartwars.io you can choose to play with people from Europe, Asia or America and transform the arena in an international battlefield. If you stomp your opponents you will get their items. But be careful or they will steal it also from you! Eliminate all the enemies you can to obtain the lead of the ranking. You can control your kart with your keyboard or mouse. In order to move use the directional keys or your mouse. If you wish to activate your shield press S or right click. And when you want to use the items you collected before press D or left click. Enter now and enjoy this massive multiplayer online game. Become the King of the Kart!